Across the globe, governments are pressuring healthcare systems stakeholders to embrace more modern approaches to managing patients’ health information. In the US, the term “meaningful use” represents the incentive program that encourages healthcare professionals and hospitals to adopt Electronic Health Record (EHR) technology. In other parts of the world, the terminology may be different, but the goal is the same: adopt technology for improved clinical outcomes and increased transparency and efficiency. Hospitals and healthcare facilities are always looking for ways to improve patient care and safety, but the changes and upgrades necessary to keep up with technology advancements and strict compliance are challenging. One common element that can help achieve long-term compliance and patient care success is strategic investment in facility infrastructure services. For example, upgraded physical cabling, which enables the deployment of EHR technology, will be needed throughout the hospital. Facility infrastructure systems support healthcare organizations’ efforts at “meaningful use” compliance in a number of different ways. Minor power fluctuations can impact the delicate voltage requirements of sensitive electronics within healthcare systems and result in loss of data. 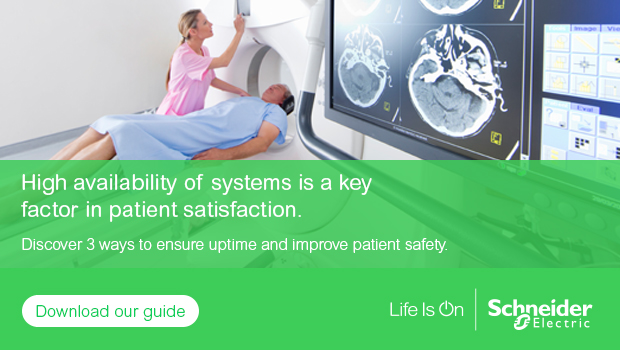 For instance, poor power quality will affect imaging equipment which is linked to patient data. Lost data can impact decisions on how to treat patients. In addition, power events affect life systems, infrastructure systems such as Heating Ventilation and Air Conditioning (HVAC), communications, records management and security. What happens if electronic medical records (EMR) systems go down as a result of a power outage or natural disaster? To minimize these risks, critical sites such as data centers and network rooms at healthcare facilities need to be power protected. Modern uninterruptible power supplies (UPS) in the data center protect the systems that house EMR data by allowing systems to continue to run when power glitches occur. Building Management Systems (BMS) also play a critical role. The BMS quickly identifies which parts of the hospital are running properly and which are experiencing water, electrical or HVAC problems. This information allows facility teams to act quickly so that downtime is limited. Smart sensors and controllers are proliferating across healthcare facilities and, in the process, gathering more and more data. Through use of analytics software, this data can then be mined to dramatically improve healthcare services. This free-flowing system of data sharing relies heavily on Wi-Fi and the physical cabling systems that actually transmit all of this data. Having the right cabling infrastructure in place enables hospitals to address the critical success factors of high data delivery speed and low latency bandwidth. In addition, IoT also enables “predictive” maintenance of core devices such as HVAC systems to be performed, thereby reducing costs and enhancing system uptime. Instead of routine scheduled maintenance, IoT-enabled predictive maintenance tools can track asset performance and identify early warning signs of deterioration. Thus, potential downtime situations can be identified and fixed before systems fail, meaning that maintenance is performed only when it’s needed. Since the technologies that run modern hospitals are becoming more and more of an extension of IT (information technology), these assets require a higher degree of both physical security and cybersecurity. IT areas such as data centers and server rooms should add access control and closed circuit TV cameras to prevent unauthorized access. OT (operations technology) systems like power and cooling are now commonly connected and accessed on the IT network. Therefore, systems moving to full IP like BMS need to be cyber secure. If not properly protected, a hacker could find a route via the BMS into the wider healthcare systems. IT teams need to include OT systems in their IT audits so that potential security issues can be addressed. A security audit by experts in both IT and OT can help determine if physical and on-line access controls are sufficient to support EMR availability and data privacy security goals.